"Bangkok International Airport" redirects here. For the airport which now serves low-cost carriers, see Don Mueang International Airport. "BKK" redirects here. For other uses, see BKK (disambiguation). Suvarnabhumi Airport (Thai: ท่าอากาศยานสุวรรณภูมิ, RTGS: suwannaphum, pronounced [sùʔ.wān.nā.pʰūːm] ( listen)) (IATA: BKK, ICAO: VTBS), also known unofficially as Bangkok Airport, is one of two international airports serving Bangkok, Thailand. The other older one is Don Mueang International Airport. Suvarnabhumi covers an area of 3,240 ha (32.4 km2; 8,000 acres), making it one of the biggest international airports in Southeast Asia and a regional hub for aviation. The airport is currently the main hub for Thai Airways International, Thai Smile Airways, and Bangkok Airways. It also serves as regional gateway and connecting point for various foreign carriers. The airport is on what had formerly been known as Nong Nguhao (Cobra Swamp) in Racha Thewa in Bang Phli, Samut Prakan, about 25 kilometres (16 mi) east of downtown Bangkok. The terminal building was designed by Helmut Jahn of Murphy / Jahn Architects. It was constructed primarily by ITO JV. The airport had the world's tallest free-standing control tower (132.2 metres or 434 feet) from 2006 to 2014, and the world's fourth largest single-building airport terminal (563,000 square metres or 6,060,000 square feet). Suvarnabhumi is the 21st busiest airport in the world, eleventh busiest airport in Asia, and the busiest in the country, having handled 60 million passengers in 2017, and is also a major air cargo hub, with a total of 95 airlines. On social networks, Suvarnabhumi was the world's most popular site for taking Instagram photographs in 2012. The airport inherited the airport code, BKK, from Don Mueang after the previous airport ceased international commercial flights. The modern Motorway 7 connects the airport, Bangkok, and the heavily industrial eastern seaboard of Thailand, where most export manufacturing takes place. The name Suvarnabhumi is Sanskrit for 'land of gold' (Devanagari: IAST: Suvarṇabhūmi; Suvarṇa is 'gold', Bhūmi is 'land'; literally 'golden land'). The name was chosen by the late King Bhumibol Adulyadej whose name includes Bhūmi, referring to the Hindu-Buddhist golden kingdom, thought to have been to the east of the Ganges, possibly somewhere in Southeast Asia. In Thailand, government proclamations and national museums insist that Suvarnabhumi was somewhere on the coast of the central plains, near the ancient city of U Thong, which might be the origin of the Indianised Dvaravati culture. Although the claims have not been substantiated, the Thai government named the new Bangkok airport Suvarnabhumi Airport, in celebration of this tradition. The need for the new airport was recognized in 1973 when 8,000 acres of land was purchased 40 kilometres east of Bangkok. The site, known as Cobra Swamp, was drained and named Suvarnabhumi, meaning "realm of gold". On 14 October 1973, student-led protests led to the overthrow of the military government of Prime Minister Thanom Kittikachorn and the project was shelved. After a series of ups and downs, the "New Bangkok International Airport" company (NBIA) was formed in 1996. Due to political and economic instabilities, notably the Asian financial crisis of 1997, construction did not begin until six years later in January 2002 by the government of Thaksin Shinawatra. The airport was due to open in late 2005, but a series of budget overruns, construction flaws, and allegations of corruption plagued the project. A further delay was caused by the discovery that the airport had been built over an old graveyard. Superstitious construction workers claimed to have seen ghosts there. On 23 September 2005, the Thai airports authority held a ceremony where 99 Buddhist monks chanted to appease the spirits. Full tests of the airport took place on 3 and 29 July 2006. Six airlines—Thai Airways International, Nok Air, Thai Air Asia, Bangkok Airways, PBair, and One-Two-GO—used the airport as a base for twenty domestic flights. The first international test flights were conducted on 1 September 2006. Two Thai Airways aircraft, a Boeing 747-400 and an Airbus A300-600, simultaneously departed the airport at 09:19 to Singapore and Hong Kong. At 15:50 the same aircraft flew back and made simultaneous touchdowns on runways 19L and 19R. These test flights demonstrated the readiness of the airport to handle traffic. On 15 September 2006, the airport started limited daily operations with Jetstar Asia Airways operating three Singapore to Bangkok flights. Bangkok Airways moved to the airport on 21 September. AirAsia and Thai AirAsia followed on 25 September and on 26 September Nok Air moved to Suvarnabhumi Airport. During this initial phase, as well as in the previous tests, the airport used the temporary IATA code NBK. 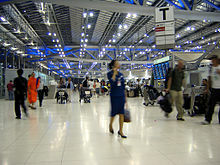 Suvarnabhumi officially opened at 03:00 on 28 September 2006, taking over all flights from Don Mueang. The first flight to arrive was a Lufthansa Cargo flight LH8442 from Mumbai at 03:05. The first commercial arrival was Japan Airlines at 03:30. The first passenger arrival was Aerosvit flight VV171 from Kiev at 04:30, and the first cargo departure was Saudi Arabian Airlines flight SV-984 to Riyadh at 05:00. Aerosvit also had the first passenger departure (VV172 to Kiev) around 05:30. Difficulties were reported in the first few days of the airport's operation. On the first day alone, sluggish luggage handling was common—the first passenger arrival by Aerosvit took an hour for the luggage to start coming out, and some flights did not have their luggage coming out even after four hours. Flights were delayed (Thai Airways claimed that 17 of 19 flights were delayed that day), and there were failures with the check-in system. Subsequent problems included the failure of the cargo computer system, and the departure boards displaying the wrong information, resulting in confused passengers (especially as unlike Don Mueang, there were no "final calls" issued). Months after its opening, issues of congestion, construction quality, signage, provision of facilities, and soil subsidence continued to plague the project, prompting calls to reopen Don Mueang to allow for repairs to be made. Expert opinions varied widely on the extent of Suvarnabhumi's problems as well as their root cause. Most airlines stated that damage to the airport was minimal. Then Prime Minister Surayud Chulanont reopened Don Mueang for domestic flights on a voluntary basis on 16 February 2007, with 71 weekly flights moved back initially, but no international flights. In January 2007, ruts were discovered in the runways at Suvarnabhumi. The east runway was scheduled to close for repairs. Expert opinions varied as to the cause of the ruts. Airport authorities and airline representatives maintained that the airport was still safe and resisted suggestions that the airport should be completely closed and all flights moved back to Don Mueang. On 27 January 2007, the Department of Civil Aviation declined to renew the airport's safety certificate, which had expired the previous day. The ICAO requires that international airports hold aerodrome safety certificates, but Suvarnabhumi continued to operate because the ICAO requirement had yet to be adopted as part of Thai law. As of early 2016, tarmac problems persisted at Suvarnabhumi. Soft spots on the tarmac, taxiways, and apron area had not been permanently fixed. Aircraft were getting stuck on the soft surfaces that are the result of sub-standard materials. "The constant resurfacing of the tarmac, taxiways and apron area with asphalt is an unacceptable patchwork solution. We literally need a "concrete" solution," said Tony Tyler, IATA's director general and CEO. In January 2007, Thai Airways announced a plan to move some of its domestic operations back to Don Mueang International Airport due to overcrowding. Three days later, the Ministry of Transport recommended temporarily reopening Don Mueang while repair work on the runways at Suvarnabhumi proceeded. At that time, Thai Airways said it would shift most of its domestic flights back to Don Mueang while keeping flights with high international passenger connections such as Chiang Mai and Phuket at Suvarnabhumi. On 28 March 2009, Thai Airways discontinued all domestic flights from Don Mueang. Bangkok Airways and One-Two-GO had similar plans, but Bangkok Airways remained at Suvarnabhumi. Thai AirAsia said it would not move unless it could shift both its international and domestic operations, prompting them to stay at Suvarnabhumi for the time being. Nok Air and PBair were undecided, but Nok Air later relocated all flights to Don Mueang, where they operate today. As of January 2010, only Nok Air and One-Two-GO operated domestic flights from Don Mueang Airport. PBair have ceased operations altogether. One-Two-GO was integrated into Orient Thai Airlines in July 2010, but continues to operate from Don Mueang Airport. As of 1 October 2012 Air Asia has moved all of its Bangkok operations to Don Mueang International Airport (DMK) from Suvarnabhumi Airport (BKK). Thai Airbus A340-500 (HS-TLA) at Bangkok Suvarnabhumi Airport. Airports of Thailand found that the cost of fixing 60 identified problems at the airport would be less than one percent of the total airline cost and the problems could be fixed in up to four to five years. Dr Narupol Chaiyut, a member of a committee overseeing service problems at the new airport, estimated that 70 percent of the problems would be fixed in 2007. Twenty of the 60 problems were successfully fixed by February 2007. Suvarnabhumi Airport's main terminal roof is designed with structural elements and bays placed in a cantilevered, wavelike form to appear to "float" over the concourse beneath. This overall design principle was to express the former essence of the site, from which water had to be drained before construction could begin. The eight composite 2,710-ton trusses supporting the canopy of the main terminal are essentially diagrams of the bending moments acting on them, with the greatest depth at mid-span and over the supports. The result of Helmut Jahn's vision is a structure with performance materials serve in their total composition and in use more than in their conventional roles. This maximizes daylight use in comfort with substantial energy life-cycle cost savings. The installed cooling system reduced up to 50 percent compared to a conventional system. A translucent membrane with three layers was developed to mediate between the interior and exterior climate, dealing with noise and temperature transmission, while still allowing natural flow of daylight into building. The airport was ranked number 36 among the world's top 100 airports in 2018. Other ASEAN airports in 2018 were ranked: Singapore Changi Airport, 1; Kuala Lumpur International Airport, 44; Jakarta, 45; Hanoi, 82. Suvarnabhumi was ranked 38 in 2017 and 36 in 2016. According to the Thailand Development Research Institute (TDRI) in 2018, the airport's ranking had not improved over the past six years. Customer complaints include: lengthy immigration waiting times; transit day room issues; insufficient numbers of chairs and phone charging points; insufficient English-speaking staff; and poor information displays. On 25 January 2007, due to work upgrading the taxiways which suffered from small cracks, a few incoming flights were delayed and several flights were safely diverted to U-Tapao International Airport in Rayong Province. On 26 November 2008, an illegal occupation of the airport took place by People's Alliance for Democracy, closing the departure lounge and blocking exits and leaving almost 3,000 passengers stranded in the main terminal and another 350,000 stranded inside the country, as all flights were grounded. The People's Alliance for Democracy seized the control tower at 12:00. On 2 December 2008, protesters agreed to leave the airport as they had been illegally protesting and permitted the resumption of flights. Security checks, clean-ups, and re-certification once the illegal occupation ended delayed the airport from being fully functional until 5 December 2008. On 1 October 2010, two hundred armed men occupied the airport's parking area for an hour, blocking the building's entrances and seizing ticket booths to collect fares from motorists. Airport security personnel failed to respond, reportedly because of an internal dispute within the parking management company, the firm contracted to run the parking facilities. Costing an estimated 155 billion baht (US$5 billion), the airport has two parallel runways (60 m wide, 4,000 m and 3,700 m long) and two parallel taxiways to accommodate simultaneous departures and arrivals. It has a total of 120 parking bays (51 with contact gates and 69 remote gates), with five of these capable of accommodating the Airbus A380. Suvarnabhumi Airport has 72 jet bridges and 69 non-jet bridges. Additionally, flights are able to park at remote locations on the ramp, from which airport buses transport passengers to and from the terminal. Suvarnabhumi Airport has 18 jet bridges and 6 non-jet bridges for Airbus 380–800. The airport's two runways can accommodate 64 flights per hour. At peak times the runways average 63 flights per hour. In April 2019 the Thai cabinet approved a sum of 21.8 billion baht for the construction of a third runway. Construction will start in 2019 and be completed in 2021. The third runway will accommodate a maximum of 30 flights per hour. The project will be managed by Airports of Thailand (AOT). The main passenger terminal building, with a capacity of handling 76 flight operations per hour, co-locates the international and domestic terminals, though assigning them to different parts of the concourse. In the initial phase of construction, it was capable of handling 45 million passengers and three million tonnes of cargo per year. Above the underground rail link station and in front of the passenger terminal building is a 600-room hotel operated by Accor Group under the Novotel brand. The airport's passenger terminal is the world's largest passenger terminal ever constructed in one phase at 563,000 square metres (6,060,000 sq ft), and is also currently the fourth biggest passenger terminal building in the world, after the Hong Kong International Airport (570,000 square metres or 6,100,000 square feet), Beijing Capital International Airport (990,000 square metres or 10,700,000 square feet), with the largest passenger terminal at Dubai International Airport (Terminal 3 is over 1,713,000 square metres or 18,440,000 square feet). The airport air-traffic control tower was the tallest in the world at 135 metres (443 ft) from 2006 to 2014. From the opening of Suvarnabhumi in 2006 to early 2017, eight people had fallen to their deaths from upper-floor walkways, prompting the airport to spend 33 million baht in 2013 building glass barriers to stop people falling or taking their lives. By mid-2015, the airport was handling more than 800 flights per day, higher than its 600-flight capacity. It has exceeded its capacity of 45 million passengers per year. Airports of Thailand (AOT) approved an investment budget for the expansion of Suvarnabhumi Airport and expected construction to begin in 2019 and finish in 2021 or early 2022. The plan was to strengthen Suvarnabhumi Airport's position as a regional aviation hub. Phase Two would raise the airport's capacity to 65 million passengers a year and would be undertaken in parallel with the construction of a new domestic terminal. The new domestic terminal will be intended to accommodate more than 30 million passengers annually. The two expansion projects are part of the overall airport enlargement that would see Suvarnabhumi raise its annual passenger handling capacity to 125 million passengers, 90 million international and 35 million domestic passengers by 2024 at an estimated cost of 163 billion baht (US$5.25 billion/€3.62 billion). The expansion includes the construction of one additional runway, subsequent enlargement of domestic and international terminals, and improvements to parking bays, car parks, and other airport infrastructure. 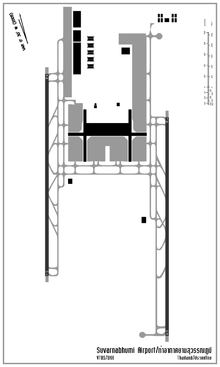 An expansion plan to increase the passenger capacity of the airport to 65 million by building an additional satellite passenger terminal linked to the current main terminal via an underground automated people mover (APM) system was set to be voted on by the AOT board during a 17 May 2012 meeting. If the plan gains endorsement by the board it will be able to proceed to appointing a project management consultant (PMC) which will bring it one step closer to commencing construction on the much needed expansion. If all goes to plan the expansion is set to be completed in 2018. The expansion also includes a plan to expand the airport parking garage as well as the expansion of the eastern end of the main passenger terminal by 135 meters along with the construction of a new airline office building. The expansion does include plans to construct a third runway of 3,700 meters. According to the Bangkok Post, the new satellite terminal will have a total of 28 gates, with eight for the Airbus A380 super jumbo jet. The new passenger terminal will be used only by Bangkok Airways and flag carrier Thai Airways (and its budget subsidiary Thai Smile). Upon completion of the satellite terminal, other Star Alliance members will be given the check-in concourse of Thai Airways. Suvarnabhumi accounted for the largest share of air traffic at Thailand's airports in 2015, handling 52.9 million passengers, up by nearly 14 percent from the previous year despite its passenger capacity of only 45 million a year. International passengers passing through Suvarnabhumi grew 15.9 percent to 44.2 million, while domestic volume edged up 4.87 percent to 8.68 million. Aircraft movements showed a 9.5 percent increase to 317,066, consisting of 247,584 international (up 11 percent) and 69,482 domestic (up 4.4 percent). In 2012, the government enjoined all low-cost airlines to move their hubs to DMK in October. The 30 billion baht Suvarnabhumi Airport Link was opened on 23 August 2010, after multiple delays. The Airport Rail Link (ARL) is operated by SRTET, a subsidiary company of the State Railway of Thailand. The standard gauge line is 28.6 kilometres (17.8 mi) long and is elevated for most of its length, running mostly above existing regional railway lines and parallel to Motorway 7 and Si Rat Expressway. There is a short at-grade/underground segment as the line approaches the passenger terminal building of Suvarnabhumi Airport. The ARL hours of service are 06:00 to 24:00. The ARL has two interchange stations, namely Phaya Thai (changing for BTS Green Line services) and Makkasan (linking Phetchaburi station of the MRT Blue Line). In the future, the ARL will complement the SRT Red Line commuter service, which comprises two-meter gauge, dual-track lines. The ARL may also be extended from Phaya Thai to Don Mueang via Bang Sue, given that the old Don Mueang International Airport has now been reopened for civil aviation under a dual-airport policy. Meanwhile, SRT provides a suburban commuter train service between Lad Krabang (the nearest station to Suvarnabhumi on the East line, one station from the airport by Airport Rail Link) and the northern suburban city of Rangsit via downtown Bangkok and the old Don Mueang Airport. The train also connects with BTS and MRT at Phaya Thai and Phetchaburi stations respectively. A shuttle bus service linking the airport with Hua Takhe railway station is provided by BMTA. The train service is currently not as popular as the bus service because it requires a shuttle bus connection. The service will be stopped when the Airport Express Link is completed. A free bus service connecting Suvarnabhumi Airport and Don Mueang Airport operates from 05.00 until midnight. Three air-conditioned city bus routes are operated by Bangkok Mass Transit Authority (BMTA) serve the airport's dedicated bus terminal. There are also direct buses between the airports operated by Airport Shuttle Bus. The airport has five main access routes. Among these the most convenient route is via the Bangkok Chon Buri Motorway (Motorway 7). Another main airport entrance is in Samut Prakan Province via the expressway from Bang Na to Bang Pakong. The airport has provided five entrance routes. The main route is via the motorway in the north of Bangkok, directly connecting Bangkok's downtown and Chonburi Province, the industrial and harbor city in eastern Thailand. However, another main airport entrance is in Samut Prakan Province, connecting an elevated highway in the south of Bangkok from Bang Na to Bang Pakong. 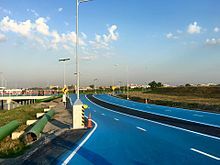 In December 2015, Airports of Thailand introduced Sky Lane (Thai: สกายเลน), a cycling track around the Suvarnabhumi airport perimeter. The entrance to Sky Lane is located in the northeastern corner of the airport area. Cyclists can bring their bicycles and bike here for free. The Sky Lane is a controlled-access, one-direction, two-lane track built only for cycling, so the riders can be ensured that they won't be bothered by any vehicle. The Sky Lane's length is 23.5 km, making it the longest in Asia. Sky Lane’s facilities, which are specially designed for cyclists, include medical, shops, food & beverage, track, parking lot and a rest area. The entrance gate is open from 06:00 to 18:00. ^ Fernquest, Jon. "Suvarnabhumi: New runway by 2018". Bangkok Post. Retrieved 20 March 2019. ^ "Air transport statistic 2016 summary" (PDF). Airports of Thailand PLC. January 23, 2017. ^ "Suvarnabhumi Airport pronunciation: How to pronounce Suvarnabhumi Airport in Thai". Forvo.com. 2010-01-20. Retrieved 2017-03-04. ^ "Bangkok Airport". BBC Three. 2015. Retrieved 2017-12-21. Series in which young Brits pass through Bangkok Airport to embark on adventures of a lifetime. ^ "Suvarnabhumi Airport (BKK) – Official Airports of Thailand (Bangkok Airport)". Retrieved 2017-12-21. ^ "Don Mueang to be city budget air hub". Bangkok Post. Retrieved 2 July 2013. ^ "AirAsia to shift to Don Mueang". Archived from the original on 29 October 2013. Retrieved 2 July 2013. ^ "Bangkok's new airport opens to first commercial flights", USA Today, 15 September 2006. ^ a b "Tallest Air Traffic Control Tower in the world". klia2.info. Retrieved 11 October 2017. ^ a b "2017 Annual Airport Traffic Report" (PDF). Port Authority of New York and New Jersey. 2018-04-10. p. 28. Retrieved 2018-05-01. ^ "Suvarnabhumi, Paragon top Instagram places list". Bangkok Post, 29 December 2012. ^ "Sanskrit Dictionary". Sanskrit Dictionary. Retrieved 2018-10-05. ^ ThaiDay, "THAI discounts tickets for historic test flights", 1 July 2006. ^ "Thailand needs to do more for higher aviation competitiveness: IATA". The Nation. 2016-02-18. Retrieved 18 February 2016. ^ Use Don Muang during repairs: 2 airlines Archived 2 February 2007 at the Wayback Machine, The Nation, 27 January 2007. ^ Move to use 2 airports gets mixed reception Archived 2 February 2007 at the Wayback Machine, The Nation, 31 January 2007. ^ "World's Top 100 Airports 2018". Skytrax. Retrieved 19 October 2018. ^ "World's Top 100 Airports 2017". Skytrax. Retrieved 19 October 2018. ^ "World's Top 100 Airports in 2016". Skytrax. Retrieved 2018-10-19. ^ Wancharoen, Supoj; Raksaseri, Kornchanok (19 October 2018). "Poor service quality dogs airport ranking". Bangkok Post. Retrieved 19 October 2018. ^ Limsamarnphun, Nophakhun (19 October 2018). "Planned airport terminal could cause chaos: experts". The Nation. Retrieved 19 October 2018. ^ Thongrung, Watcharapong (26 January 2007). "Minister Admits: Some airlines afraid to use new airport". The Nation. Archived from the original on 3 March 2016. Retrieved 3 September 2016. ^ "Thai protesters shut down airport". BBC News – Asia-Pacific. Retrieved 3 June 2015. ^ Agence France-Presse. "Thai protesters agree to clear airport: protest leader". ABS-CBN News. Retrieved 3 June 2015. ^ "Third runway approved for main airport". The Nation. 2019-04-18. Retrieved 2019-04-18. ^ Mahitthirook, Amornrat; Chayutworakan, Suttiwit (31 March 2017). "Foreign man falls to death at Suvarnabhumi". Bangkok Post. Retrieved 31 March 2017. ^ Sritama, Suchat (2015-05-24). "Open-sky policy must continue, say airlines". The Sunday Nation. Retrieved 24 May 2015. ^ "Airports of Thailand approves B42bn for Suvarnabhumi expansion". Bangkok Post. 20 June 2018. Retrieved 1 September 2018. ^ a b Phataranawik, Phatarawadee (1 September 2018). "Conflict of design". The Nation Weekend. Retrieved 1 September 2018. ^ "2nd phase development to be finished one year ahead". The Nation. 15 December 2011. Retrieved 3 June 2015. ^ Bangkok Post, Minister supports airport expansion, 30 August 2011. ^ Kositchotethana, Boonsong (27 April 2012). "Suvarnabhumi expansion advances". Bangkok Post. Retrieved 13 September 2016. ^ Kositchotethana, Boonsong (10 February 2015). "2 Thai carriers to share new terminal". Bangkok Post. Retrieved 13 September 2016. ^ Air China adds Lianyungang – Bangkok service from late-Dec 2017 Routesonline. 26 December 2017. ^ a b "Air India expands Bangkok network from mid-Oct 2018". Routesonline.com. Retrieved 2018-10-05. ^ a b Chandra, Jagriti (3 October 2018). "Air India to launch six new flights". The Hindu. Retrieved 3 October 2018. ^ "ישיר לבנגקוק: ארקיע שברה את המונופול, המחיר נחתך". Ynet.co.il. 2017-05-14. Retrieved 2018-10-05. ^ Ltd. 2019, UBM (UK). "Bangkok Airways opens Bangkok – Cam Ranh reservation for Jan 2019 launch". Routesonline. Retrieved 23 January 2019. ^ Liu, Jim (28 November 2017). "Bhutan Airlines adds Gaya service in W17". Routesonline. Retrieved 28 November 2017. 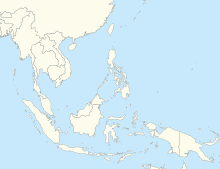 ^ a b "China Eastern expands South East Asia Network in S19". routesonline. Retrieved 12 March 2019. ^ "【7月1日起】东航广州-曼谷，约吧！". Mp.weixin.qq.com. 2018-06-07. Retrieved 2018-10-05. ^ Ltd. 2019, UBM (UK). "China Express plans Zhanjiang – Bangkok from late-Oct 2018". Routesonline. Retrieved 23 January 2019. ^ "China Southern adds Sanya – Bangkok service from Feb 2019". routesonline. Retrieved 31 January 2019. ^ "China Southern adds Urumqi – Bangkok service from late-Oct 2018". Routesonline.com. Retrieved 1 August 2018. ^ "China Southern adds Zhangjiangjie – Bangkok route in W18". Routesonline.com. Retrieved 17 September 2018. ^ "EGYPTAIR revises Hong Kong preliminary launch to Sep 2018". Routesonline.com. Retrieved 2018-10-05. ^ Emirates S19 service changes as of 12JAN19 Routesonline. 12 January 2019. ^ a b Liu, Jim. "Lufthansa W19 Long-Haul changes as of 15MAR19". Routesonline. Retrieved 16 March 2019. ^ "GX Airlines adds Nanning – Bangkok from late-Dec 2018". Routesonline.com. Retrieved 21 November 2018. ^ "Hebei Airlines adds Guiyang – Bangkok from late-Oct 2018". Routesonline.com. Retrieved 2 October 2018. ^ "Hebei Airlines adds Lianyungang – Bangkok service in S19". routesonline. Retrieved 12 March 2019. ^ HK Express resumes Bangkok service from late-March 2019 Routesonline. 8 January 2019. ^ a b c "IndiGo new flights". Goindigo.com. Retrieved 2018-09-02. ^ Chuenniran, Achadtaya (23 November 2018). "New direct service to Phuket to boost tourism from India". Bangkok Post. Retrieved 24 November 2018. ^ "Jeju Air plans Cheongju – Bangkok service in W17". Routesonline.com. Retrieved 8 December 2017. ^ "Jeju Air schedules international service from Muan in 2Q18". Routesonline.com. Retrieved 2018-10-05. ^ "Kunming Airlines adds Kunming – Bangkok route form late-Oct 2018". Routesonline.com. Retrieved 1 October 2018. ^ "Lucky Air plans Zhengzhou – Bangkok route from Oct 2018". Routesonline.com. Retrieved 9 August 2018. ^ "Lufthansa S19 long-haul changes as of 05OCT18". Routesonline.com. Retrieved 8 October 2018. ^ Ltd. 2019, UBM (UK). "Maldivian adds Hangzhou service in Sep/Oct 2017". Routesonline. Retrieved 23 January 2019. ^ Liu, Jim. "Okay Airways adds Nanning – Bangkok service in S19". Routesonline. Retrieved 12 March 2019. ^ "PIA launches new routes to Bangkok, Kuala Lumpur". Geo.tv. Retrieved 23 January 2019. ^ "PIA LHE-BKK shedule". Historyofpia.com. Retrieved 23 January 2019. ^ Ltd. 2019, UBM (UK). "Sichuan Airlines plans Wuyishan – Bangkok service from Nov 2018". Routesonline. Retrieved 23 January 2019. ^ "Spring Airlines adds Xuzhou – Bangkok service from April 2019". routesonline. Retrieved 11 March 2019. ^ Thai Smile adds Hong Kong service from late-Oct 2018 Routesonline. 13 September 2018. ^ "Thai Smile adds Kolkata service in S19". routesonline. Retrieved 1 February 2019. ^ "Thai VietJet Air adds Bangkok – Da Nang service from Oct 2018". Routesonline.com. Retrieved 25 September 2018. ^ Thai Vietjet Air schedules Taichung flights from Nov 2018 Routesonline. 13 September 2018. ^ a b Liu, Jim (2 June 2017). "Ural Airlines expands China - Thailand flights from July 2017". Routesonline. Retrieved 2 June 2017. ^ "Xiamen Airlines expands Thailand service in S18". Routesonline.com. Retrieved 26 January 2018. ^ "EVA Air Cargo outlines Boeing 777 Freighter service in W17". Routesonline.com. Retrieved 2018-01-31. ^ "MASKargo adds new intra-Asia routing in S18". Routesonline.com. Retrieved 2018-10-05. ^ a b "Annual Airport 2017" (PDF). Airports of Thailand PCL. Retrieved 2018-08-05. ^ Kositchotethana, Boonsong (2016-02-01). "AoT airports set new record in passenger traffic". Bangkok Post. Retrieved 1 February 2016. ^ "Passenger Traffic 2010 FINAL". Airports Council International. 1 August 2012. Archived from the original on 29 April 2012. Retrieved 29 April 2012. ^ "Airport Link to start commercial operation Aug 23". Mcot.net. Archived from the original on 4 March 2012. Retrieved 10 February 2012. ^ "Airport Rail Link". Suvarnabhumiairport.com. 15 January 2016. Archived from the original on 27 June 2015. Retrieved 4 March 2017. ^ "Thailand to get Longest bicycle lane in Asia by 2017". Bangkok Post. Retrieved 16 April 2016. ^ "Official Website". Sky Lane Thailand. Archived from the original on 2016-07-13. Retrieved 2018-01-31.